Will Longyearbyen get the northernmost brewery in the world? Home → * News and Stories → Will Longyearbyen get the northernmost brewery in the world? On Svalbard, sale and production of alcoholic drinks are currently regulated more strictly than in mainland Norway. Apart from bars and restaurants, alcoholic drinks are only sold by the governmental monopolist “Nordpolet” in Svalbardbutikken in Longyearbyen and there the allowance is limited for everyone. Locals have a card and tourists use their flight ticket to document purchases. Production of alcoholic drinks is completely prohibited, both for commercial purposes and for private consumption. These regulations are now under reconsideration and it seems they might soon be history. It is four years ago that Robert Johansen contacted the Norwegian Health Department to apply for the concession for a brewery in Longyearbyen. This was not possible under given legislation, but for once, authorities were welling (after all, it was about beer!) so this turned out to start the process for a legislative amendment. Currently the Norwegian authorities decide on the suspension of the regulations, which date partly back as far as 1929. The Departments of Health and Agriculture did already signal that a change of regulations is welcome and that no reasons are seen against it. If the legislative amendment comes, the production of alcoholic drinks will be made possible as a start. Later the quantitative limitation for the sale of alcohol may be abolished. 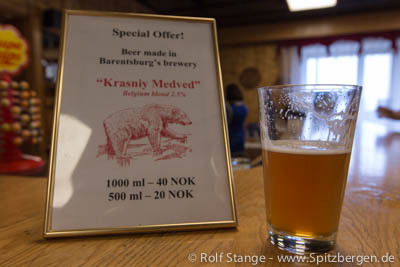 If everything proceeds as expected, Robert Johansen wants to offer beer “made in Longyearbyen” as soon as summer 2014. His brewery will be called Svalbard Bryggeri AS and will start with a production of ca. 100.000 liters per year. Sale of related souvenirs is also planned. There are reactions on the expected amendment in Barentsburg as well. There the Russian mining company Trust Arktikugol already applied for the concession for a brewery – which already exists since 2013 as part of the mining company. When the brewing in Longyearbyen really starts, Svalbard Bryggeri will be the northernmost brewery in the world. Currently Mack Brewery in Tromsø claims this title and it might keep it officially as with an annual production of 100.000 liters Svalbard Bryggeri would be a microbrewery according to Norwegian law. This term describes small breweries with an annual production lower than 600.000 liters. Several mcrobreweries are currently planned in Norway, north of Tromsø, for example in Hammerfest and in the municipality of Gamvik. The Mack Brewery faces the arising competition positively but as a big brewery it classifies itself in another category. Some years ago for financial reasons the Mack Brewery moved its beer production to Nordkjosbotn wich is located south of Tromsø. Mack nevertheless claims the title “the world´s northernmost brewery” because the company´s headquarter is still in Tromsø.